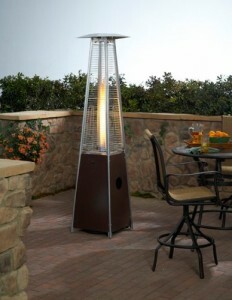 AZ Patio Heaters is one of the most popular brands of outdoor heaters today. The company’s products not only have a distinct look, but they also come in several varieties. One of AZ’s bestselling outdoor heaters is the HLDSO-WGTHG, a stand-alone heater with a hammered bronze finish and a quartz glass tube. Here, we give you our analysis and review of the product. In a hurry? Click here to get the HLDSO-WGTHG! Let’s start with the features. To summarize, the key features of the HLDSO-WGTHG include the following: wheels, 40,000 BTU’s butane heat output, 91 inches in height, 65.2 pounds in weight, 87-inch quartz glass tube, and a hammered bronze finish. Here are other important details that you should know. This patio heater is made in China. This runs on propane gas. Upon unboxing your package, you need to take off the plastic wrapping and assemble the parts. Since it’s not legal to ship propane gas, this heater does NOT come with a propane tank. You need to get one at any grocery or gas station. The HLDSO-WGTHG does not have an anti-tip over feature. – Stability. Unlike the Fire Sense 60485, the HLDSO-WGTHG has a stable triangular design or base. But according to one buyer, it can be blown over, so don’t place it in an area where it’s windy. – Mobility and portability. With the wheels, this heater is easy to move from one place to another. – Performance. Different consumers report different experience. But the general consensus is that this unit does not heat a wide space. One said that there is little effect beyond 6 feet. – Design. The bronze design looks attractive when the heater burns. – Other issues. Complains to consider include: unnecessary step of removing the plastic wrapper, and the unit is sensitive to vibrations. Judging from the above-stated consumer feedback and rating, the AZ Patio Heaters HLDSO-WGTHG is best for warmer climate areas where at night, it can become a bit chilly, or places where it’s chilly at night but not windy enough to tip this heater over. You may need help with the assembly. Get the AZ Patio Heaters HLDSO-WGTHG here!